Jimmy Doolittle stands next to the Curtiss R3C. Designed purely for speed, the R3C could be converted from a seaplane to a landplane, and it won races as both. Designed purely for speed, the R3C could be converted from a seaplane to a landplane, and it won races as both. Among its many innovative features were radiators for cooling the engine that were built into its wings and fuel tanks built into the floats. Army Air Service Lt. James H. “Jimmy” Doolittle and the Curtiss R3C-2 racer won the prestigious 1925 Schneider Trophy competition at Baltimore, Maryland, on October 26, 1925, with an average speed of 373 km per hour (232 miles per hour). The next day Doolittle flew the R3C-2 over a straight course at a world-record speed of 395 km per hour (246 miles per hour). The R3C-2 competed in two other races. The week before Doolittle’s victory, on October 12, Army Air Service Lt. Cyrus Bettis raced the airplane in its R3C-1 landplane configuration to win the Pulitzer Trophy race. 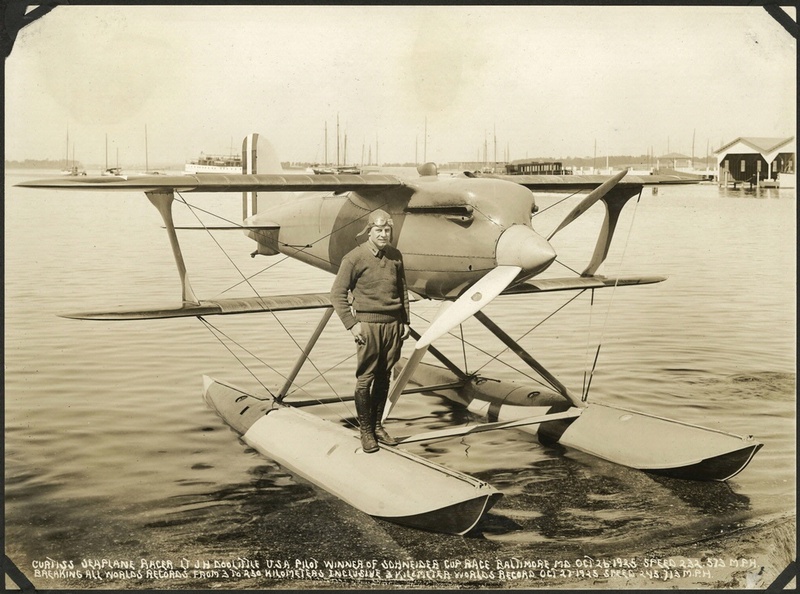 On November 13, 1926, Marine Corps Lt. C. Frank Schilt placed second in the Schneider Trophy competition at Hampton Roads, Virginia. The Smithsonian acquired the R3C-2 in 1927. Find out more about The Curtiss R3C-2.